HAMPTON, Va. (February 7, 2019) – The Hampton University Musical Arts Society is celebrating the Department of Music’s 91 years of existence with a special music concert featuring The Nathaniel Dett Chorale, Saturday, March 23, 2019 at 4:00 p.m.
“This wonderful musical performance will honor the rich history of how the Hampton University Department of Music came to be. It honors the dynamic leader who worked tirelessly to ensure that the department became a success,” said Hampton University President, Dr. William R. Harvey. Under Robert Nathaniel Dett, the Department of Music was formally organized in 1928. 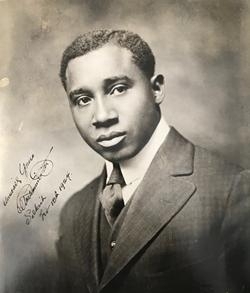 During his time as director, 1928-1932, Dett founded the Hampton Choral Union, Musical Arts Society, and the Hampton Institute Choir and School Music, now the Hampton University Department of Music. Dett was also a professor of music, organist, composer, poet and essayist. One of Dett’s most remembered milestones during his time at Hampton was when the choir embarked on a European tour under the patronages of George Foster Peabody, a philanthropist and trustee for Hampton Institute. The choir of 40 voices impressed the European audiences during its six-week tour of seven countries. The upcoming musical concert celebrating the Hampton University Department of Music, will feature The Nathaniel Dett Chorale, a professional choral group dedicated to Afrocentric music of all styles and genres of music appropriate to the traditions of Africa and its Diasporas. The founder of the group, D. Brainerd Blyden-Taylor, named The Chorale after internationally renowned composer Robert Nathaniel Dett, who performed at prestigious concert venues including Carnegie Hall and Boston Symphony Hall. Dett was dedicated to the cause of Black music. Blyden-Taylor, founder, artistic director and conductor, established The Nathaniel Dett Chorale to draw attention not only to Dett’s legacy, but also to the wealth of Afrocentric choral music. “This concert will be an extraordinary experience for Hampton University students, faculty, staff and the surrounding communities. It will continue the legacy of Robert Nathaniel Dett and Hampton University, which are so intricately woven. Anyone who comes in contact with Hampton University and the Department of Music will benefit from the long and rich legacy of music,” said Dr. Shelia J. Maye, chairperson of the Hampton University Department of Music. The Hampton University Department of Music celebration concert presented by the Musical Arts Society, featuring The Nathaniel Dett Chorale, will take place Saturday, March 23, 2019 at 4:00 p.m. in the Hampton University Memorial Church. The concert is free and open to the public. If anyone is interested in being a sponsor for the concert, contact the Department of Music at 757-728-6508.